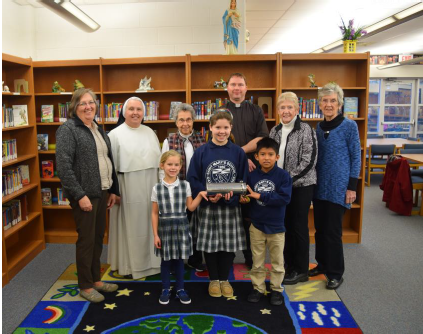 SUBMITTED: To conclude St. Mary Parish’s 75th-anniversary celebration, a time capsule has been created that will be blessed, buried and secured with concrete, waiting to be unearthed by parishioners during their 100th anniversary. Inside the capsule will be signed messages, describing how life is experienced in the parish today, as well as how life is expected to be in 25 years. The letters were written by key groups, including St. Mary’s School students, faculty and staff, parishioners and clergy, as well as groups within and connected to the parish. The notes also include joyful messages of faith, hope, and love for the SMOR parishioners of 2043. The Capsule Ceremony will be held on Wednesday, December 12th, beginning at 2 pm. Students and parishioners will pass the capsule one to another until it reaches its final destination, where it will be blessed and buried for future generations to discover and enjoy. Coffee, hot chocolate and fellowship are to follow the ceremony. Oak Ridge has a rich history in the United States: Since 1943 St. Mary’s has been a part of it! The story of Saint Mary’s Parish is unusual in the annals of modern Church history as it grew out of the Atomic Age created by the development of Oak Ridge. Founded in 1943, it has served well the religious needs of the faithful for now over 75 years. Today, Saint Mary’s Parish is a vibrant, growing Catholic community whose foundation was laid by many of the original parishioners who are now complemented by the on-going influx of new parishioners throughout the years.